The Pattaya Business & Tourism Association and American Bully Register Association announced the Pattaya Bully Expo will be held Jan. 26 at the Eastern National Indoor Sports Stadium. Pure-bred American Bully dogs will return to Pattaya for the first time in seven years to showcase canines bred from the American Pit Bull and American Staffordshire terriers. The Pattaya Business & Tourism Association and American Bully Register Association are sponsoring the Jan. 26 Pattaya Bully Expo at the Eastern National Indoor Sports Stadium. 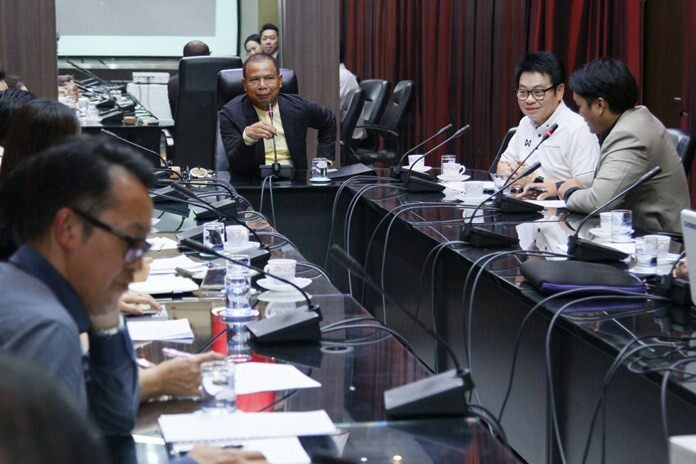 Deputy City Manager Sutham Petchked met Dec. 28 with local tourism officials to begin planning the event with Eakasit Kunanantakul, head of the Employer Council of Thailand. Organizers claim the show will be the largest of its kind in Asia with purebreds from more than 20 countries competing for ribbons and trophies. The last show in Pattaya was held in 2011. The event also will be a platform for government officials to advocate sterilization of street dogs and vaccinations for more ordinary breeds. Bully owners and fans acknowledge that while the Bully’s lineage includes the aggressive, oft-maligned pit bull, Bullies are, in fact, a very docile, friendly breed. It was created by American Kennel Club breeders to be the “ultimate family companion” and is known to be outgoing and eager to please. The AKC notes, however, that young Bullies do have aggressive instincts that need to be curbed through training. The Bully arose on the east and west coast of the U.S., but now can be found in Europe and Asia.